Judging from the amount of comments I got on my Vegan Orange Chicken Recipe I’d say it was a hit! I’m glad that so many of you took the time to let me know how much you enjoyed it! Keeping in line with the “Panda Express” menu, here’s a Spicy General Tso Tofu I made for dinner last night. I got quite a few hints asking for this, so I hope you enjoy it as well. Once again, it worked beautifully this way – as the tofu only took minutes to prepare before popping it in the oven, leaving me lots of time to concentrate on making the sauce. The stir-fry itself also went quickly as I used frozen vegetables and then just mixed everything together to coat evenly. Slightly sweet, with just a hint of spice, with crispy tofu and lots of crunchy vegetables, served over a bed of steaming white rice. You’ll want a block of extra firm tofu, pressed to eliminate as much moisture as possible. Since I used pineapple chunks in my stir fry, I used the juice to marinate the tofu after cutting it into 1″ cubes. Use a shallow dish and stir the pineapple juice with a tablespoon of soy sauce and then toss your tofu cubes to coat. Let these rest in the refrigerator while you heat your oven to 350 degrees. Before laying your tofu cubes out on a parchment lined cookie sheet to bake, drain the marinade and toss them with 2 tablespoons of corn starch. This will crisp them up even more while baking. Bake for 45 minutes until golden and crispy. In a medium-sized saucepan, saute the minced ginger and garlic in about 1/4 cup of low sodium soy sauce until softened. Then add the remaining sauce ingredients, the Chile Garlic Paste, the remaining Soy Sauce, Rice Vinegar, Sugar, Mirin, and Tahini. Traditionally in Asian Stir Frys, chefs will use Sesame Oil to saute and add flavor. To keep this as oil free as possible, I used a tablespoon of Tahini instead. Although this does add some fat to the sauce, it is nowhere near as much as using oil, and still adds a bit of Sesame flavor. But if it is a concern you can omit this step entirely. Again, once the sauce has simmered for 5-10 minutes, make a slurry of 1 tablespoon corn starch and 1 tablespoon cool water and mix this in to thicken. I used a 12oz bag of Steamfresh Vegetables for my stir fry. The vegetables were Broccoli, Sugar Snap Peas, Carrots, and Water Chestnuts which I thought would compliment an Asian dish nicely. I also added about 1/2 a container of Mushrooms I had left over in the fridge, an 8oz can of Pineapple Chunks I had drained earlier, 1/2 cup of raw cashews, and some Green Onion for garnish. If you want to go the traditional route, simply using Broccoli and Green Onions for garnish would give it more of a General Tso look. But I like lots and lots of veggies – so it’s up to you. As always with any stir fry, use just a small amount of veggie broth or water to keep things from sticking in the beginning, because as they cook they’ll release their own leaving you plenty of juice. Stir fry until just crisp tender and then add in your Tofu and Sauce and stir to combine. I really love the comments from everyone, so if you make this and enjoy it, please leave me a note or a photo. 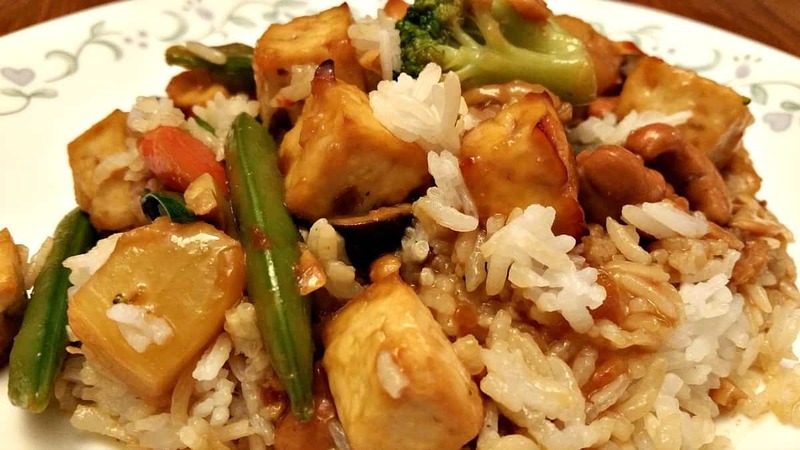 A sweet and spicy version of a Takeout Classic - General Tso Tofu. Crispy baked tofu stir fried with Asian Vegetables in a spicy General Tso Sauce. First time cooking tofu. Great recipe, we loved it ! Made it with fresh veggies and some frozen. Hubby’s takeout fav is General Tso – and he said this was “great”! I hate takeout General Tso because it is waaay too sweet and syrupy. This was perfect and I enjoyed it as well! I’m not sure the tofu needs the cornstarch because once I mixed it in, it lost its crisp. It definitely picks up all the flavors. The cashews are a nice complement as well. Whenever we think we want takeout Chinese, I always say we could make better at home. This recipe proves it! Thank you! I am pretty new to vegan cooking. Your recipe site is my favorite. My husband just loved this dinner. I changed out a few spices,sauces to fit what we liked and had on hand. The method to fix the tofu was fabulous. I did add some red pepper flakes to the corn starch before tossing the cubes and served the pineapple on the side instead of cooking it with the veggies. Not strictly General Tso when I was done, I guess but SO good. Thank you! Chuck, you’ve hit another home run! This will appear in our weekly rotation for sure. I read from another review that the cornstarch on the tofu was not necessary so I omitted it. I also omitted the wine because I could not find it in my grocery store. Instead of water to make the slurry I use the marinade for the tofu. I used fresh vegetables (broccoli, carrots, celery and bell peppers). I air fried the tofu full blast 30 minutes. I can’t wait to make this again. Super flavourful and easy to put together. Thanks from one of your greatest fans!